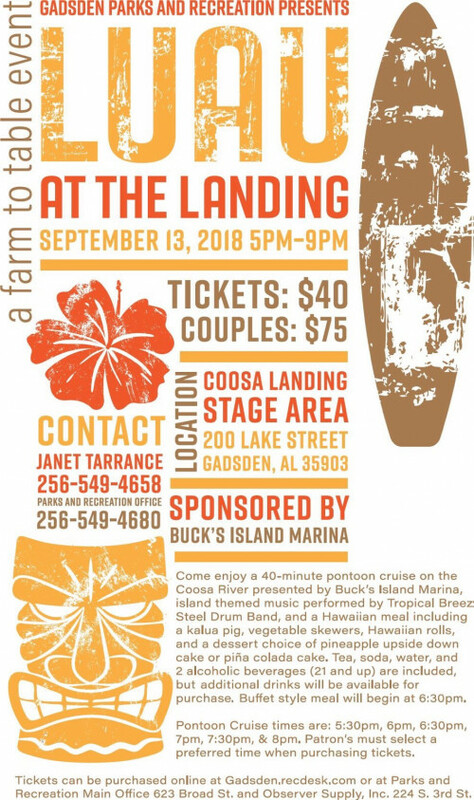 Come enjoy a 40 minute pontoon cruise on the Coosa River presented by Buck's Island Marina, island themed music performed by Tropical Breeze Steel Drum Band, and a Hawaiian meal including a kalua pig, vegetable skewers, Hawaiian rolls, and a dessert choice of pineapple upside down cake or pina colada cake. Tea, soda, water, and 2 alchoholic beverages (21 and up) are included, but additional drinks will also be available for purchase. The buffet style meal will begin at 6:30PM. Pontoon Cruise times are 5:30PM, 6PM, 6:30PM, 7PM, 7:30PM, and 8PM. Patron's must select a preferred time when purchasing tickets. Tickets can be purchased online at gadsden.recdesk.com or at the Parks and Recreation Main Office at 623 Broad Street and Observer Supply, Inc. at 224 S. 3rd Street.